Bathrooms can be a troublesome room to deal with when choosing window treatments. After all, you need natural light, especially since bathrooms are typically fairly small. Natural light is practically a necessity for smaller rooms, however, bathrooms need privacy. So how to balance the need for sunlight and the need for privacy? 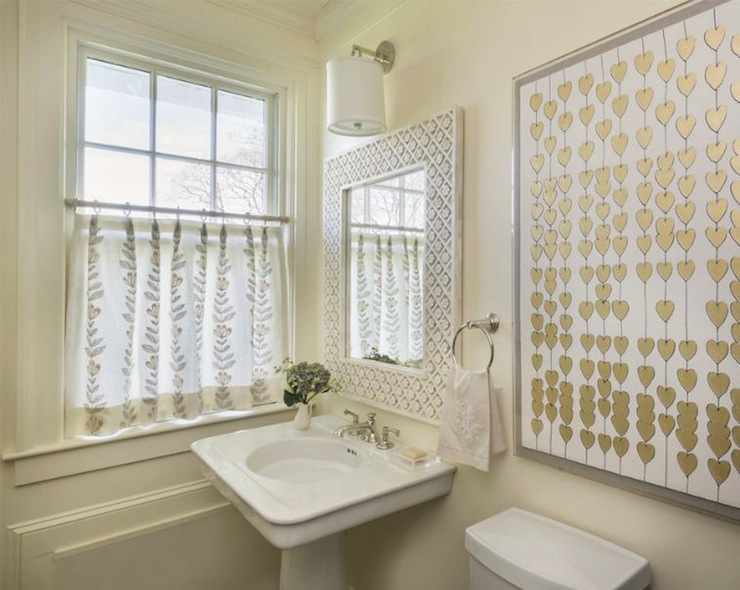 We’ve come up with a few bathroom window treatment ideas and solutions that you may be able to use in your own bathroom, however you can call us up at DECO Window Fashions if you ever have any trouble. We can help you find the best window treatment for your bathroom. 1. Cafe curtains are a great window treatment option for a bathroom. With cafe curtains you receive both privacy and sunlight. They provide privacy on the lower part of the window and the upper part is still open to light and pretty views. However, the privacy you gain is very modest – while no figures can be directly seen, silhouettes can still be seen because the material is so lightweight. This window treatment would be best used on a second floor window in a bathroom that doesn’t face the street or a neighbor’s house. 2. Faux wood blinds are a popular window treatment choice for bathrooms. They look like real wood blinds, but are moisture resistant – something that is very handy in a bathroom. These window treatments are easy to clean and can let in light when you want them to. There are a multitude of faux wood blind options that can work with your bathroom decor. 3. Woven wood shades might be a good option for you if you prefer a casual or contemporary interior design style. These shades let light in but make it difficult for anyone to see in. It’s perfect for anyone who prefers privacy, especially if you add a blackout liner to the shade. This also allows you to let in any amount of light you’d like as you can always raise the shade up to enjoy the sunshine. 4. Window film is a great, inexpensive option for people looking to solve their privacy issues in the bathroom. Frosting the bathroom windows can be done in several ways. One of the ways is to buy frosted window stick ons (some are plain while others are decorative) and place it on the window pane. HGTV explains how to frost your own windows simply. You could also use “stained glass” if you’d prefer color – it all depends on what you’d prefer for your bathroom. 5. Roman shades are a perfect bathroom window treatment. They’re very practical and very pretty. You get to have control of natural light. Not only that, they absorb sound, which is nice when you’re trying to blow-dry your hair in the bathroom. There are a multitude of colors and patterns to choose from making it easy to match the tone of the bathroom. Just remember, if you choose to use roman shades, to choose a fabric that is mildew resistant and easy to clean. 6. Valances aren’t a great option for those seeking privacy but if your windows are already fairly private (as in it’s difficult to see inside the bathroom) then valances might be a fun way to decorate the window. It adds softness and color to a room which may work very well depending on your bathroom. We can help you discover the perfect valance for your bathroom. 7. Vinyl shutters are a great, clean-looking window treatment. They look chic and classy, and allow both privacy and sunlight. You have the power to control the shutters – you get to decide how much sunlight can be let in and how much privacy you need. One great option for those who’d prefer more natural light is to use vinyl shutters like cafe curtains and install them only on the lower part of the window. 8. Another window treatment option is to use curtains that are made out of outdoor fabrics. Outdoor fabrics are typically used to upholster outdoor furniture and are designed to withstand sunlight and dampness making it an ideal choice for a bathroom curtain material. 9. Mixing it up is another great option because who can choose just one window treatment option? You will create a unique look if you mix and match the window treatments. Use shutters with a valance or drapes over blinds. We can help you choose what options would mix and match best. If you still have questions or are interested in purchasing window treatments to increase privacy in your bathrooms, call us at (512) 250-8600 or visit our store in Austin. We can help you choose the best window treatment for your bathroom needs and decor.